We have tried just about every version of Kraft Macaroni and Cheese that has showed up on the local store shelves. We started with the recognizable blue boxes our moms made, progressed to single bowl microwave and just recently the many versions of the self contained cups. The cups are coming with the regular thin long macaroni, as well little cut out figures that we each have our favorites. Just about ever generation of kids through preschool has sat down in class and stuck macaroni to a card, creating something special for our moms to hang on the refrigerator. The macaroni folks seem to appreciate that kids today are going digital but it is still fun to play with the limitations of macaroni bits. Unlike a free line drawn, placing the noodles end to end and next to each other takes a bit more talent. 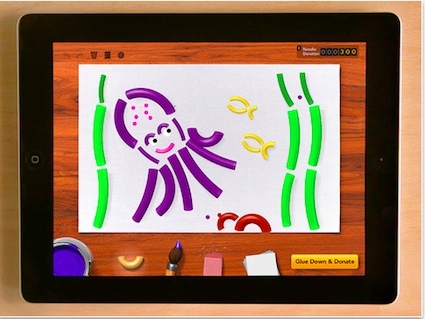 Which, if fun for the whole family to do together or compare their creative art. The free app, KRAFT Macaroni & Cheese “Dinner, Not Art.” offers you not only macaroni to place and move around, but also you can color those noodles. Much easier than having to have all those little Dixie cups on the table, each with their own colors. A nice twist to creating art with the Dinner, Not Art app is that Kraft will donate macaroni to those in need when you finish your art piece. For every noodle you use in your picture, Kraft will give 10 noodles to Feeding America. 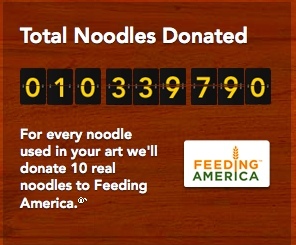 The only limits is 100 noodles max in your art and the donations go to the end of 2012. Free fun and a good cause!